Sandor was a printer noted as a mentor to younger Catholics — including the orphanage that shared his print-shop’s building. When his Salesian order was suppressed in 1950, Sandor had to continue this work underground, practically inviting martyrdom. At one point his superiors in the order urged him to flee Hungary; Sandor stubbornly stuck around under an alias. This shadow existence was bound to be a fleeting one. The Hungarian secret police kept close tabs on him, and when it found that he was in contact with a guard close to the party leadership, it made a national security case out of the affair — arresting nine of its own spooks, five priests, and several civilians. In a secret military trial, Sandor and three others were condemned to death by hanging for plotting against the state. One of those sentences was modified to life imprisonment, but the other three hanged on June 8th. Their families only got definitive word of their fate in 1955. 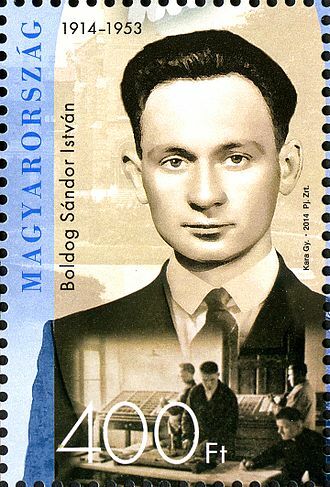 Sandor was officially rehabilitated by the post-Communist government in 1994. In 2013, Pope Francis beatified him.